Charles Staley is a sports conditioning specialist and author of the book, The Science of Martial Arts Training. Fightingarts: Mr. Staley, I understand that you are a martial artist yourself as well as being a highly respected strength coach, athlete and writer. Would you mind telling our readers a little about yourself? Staley: Please call me Charles...I started martial arts training at age 11 and continued my physical practice until I was 31, at which point I felt I had exhausted my potential as a martial artist. I wanted to pursue other avenues, specifically the discus throw. I am currently 40 years of age. In any event, to sum up my story, I'm just a geek who learned a lot in my compulsive desire to become a successful athlete (which unfortunately, never happened!). I consider myself a teacher specializing in physical preparation. For the past 20 or so years I have done nothing but train, study, eat, and sleep. And I mean that literally. Don't try to get inside my head- you'll just get hurt! But anyway, whether I'm writing, teaching seminars, or working with athletes, to me, it's all teaching. I know my craft and I'm an effective communicator. I'm not a "trainer." You train animals, not people. FA: Many martial artists fear that strength training will have a detrimental effect on their martial abilities, for example, decreased flexibility and/or loss of speed. Could you address these concerns? Staley: Well, the irony is that, in all other athletic disciplines, strength training is universally used to enhance all of these attributes, yet, in the martial arts, people are afraid that strength training will impair their abilities. Of course, like anything else, strength training is a tool: use it properly, good results; improperly, bad results. If I try to turn a screw with a hammer, I'm going to end up hating hammers, when the fault resides within myself, not in the tool itself. As it turns out, most athletes use strength training improperly, and this fact enables my career as a conditioning specialist. FA: Charles, could you discuss the benefits of strength training by weights for the martial artist as opposed to developing strength by the use of isometric exercises, dynamic tension and a regimen of various calisthenics? Staley: Well first, let's just call strength training the method and weight training, isometrics, dynamic tension, and so on, would be thought of as the specific means within the method. Many people tend to view strength training and weight training as one and the same, when in fact the latter is just one way of implementing the former.But to answer your original question, there are many, many benefits. We can start with some of the more obvious ones, such as the improvement of force output capabilities. A strength trained athlete can exert greater force on any given effort (absolute strength). He can also apply that force more quickly (speed strength), and he can exert greater force over a succession of intense efforts (strength endurance). The practical benefits of this should be fairly obvious, but for example, if, during a jump, one can exert more force through the ground with his feet, then he jumps higher, and so on. Now, what happens when we enter these discussions is that the martial arts are traditionally based on technique, which I would define as getting more done with less energy-- getting in the position of best leverage, using the opponent's energy against himself, all of that. So when I talk about strength, the knee-jerk reaction is "We use technique, not strength." However, if we match Steffi Graf against Michael Chang, who will win, and why? FA: I'd have to bet on Chang! Staley: Exactly. Because, if you have two competitors with equal technical and tactical ability, then the strongest one wins. So we're not suggesting that a martial artist forsake his or her technical training in order to become stronger, we're just saying that strength development has an important place in training. FA: OK, with that in mind, this brings up another question. As you know, martial arts training can be extremely demanding, so how is itpossible to balance this type of training with a quality strength training regimen without overtraining? Staley: As a kid in high school, I remember that I didn't have enough time or energy to work a full time job when school was in session. So, I'd take a full time job in the summer, and then drop back to part time when school was in. Incorporating strength training into your total program works the same way. You can't simply add it on, but rather, you must integrate it into your existing schedule. Let me elaborate a bit on this if I may. In the beginning, the skills that make up a martial artist's training will actually improve strength. In other words, throwing side kicks makes the legs stronger, and so on. But after a time, the body will habituate to throwing those kicks, and you don't get any stronger. At this point kick training is still important for continued technical development, but if one wishes to further increase kicking strength, we need to engage in supplementary strength training. This might consist of weight training, jump drills, elastic tubing, there are many possible components, but it doesn't have to take over your life. Three to four weekly sessions lasting 30-45 minutes each are usually plenty. When you first initiate a strength training program, you should reduce the volume (amount) of your martial arts training for the first 3-4 weeks or so. If you've been training in the arts for a long time, you'll be able to maintain your skills even on a reduced training volume. But this will make room for the inclusion of the new training element. Once the body has adjusted, you can increase the volume again. On a macro view, if I'm training a competitive martial artist for a fight, we do the bulk of the strength training work early in the cycle. Then, as the date approaches, the volume of strength training is reduced to allow for more sparring, technical drills, endurance activities, and so on. Although the volume is reduced, intensity is not. This is what maintains the adaptation. So, in other words, early in the cycle, if the athlete does, say, 12 sets of 2 repetitions with 225 pounds, later in the cycle he may use the same weight or even heavier for perhaps 4 sets of 2 repetitions. Compared to what he did earlier in the cycle, this is a picnic, and leaves him fresh for the other aspects of his training that he now needs to focus on. FA: Since you've used an example of a particularly low-repetition format here, could you share your thoughts in regard to the low weight-high repetition type training so popular with any martial artists these days? Staley: Yes, it doesn't work. Should I elaborate? "Skilled:" 200 pounds for 6 sets of 5 repetitions. First, a significant aspect of "skill" in most exercises is the process of setting up and exiting the set. For example, during a bench press, the athlete must learn and perfect how to position him/herself under the bar properly, how to center the grip, how to tuck the scapulae, where to place the feet, when and how to take in the first breath, and so on. At the completion of the set, the athlete must learn how to safely re-rack the bar, how to sit up from the bench without straining the back, and so on. During the back squat exercise, the athlete must learn how to wedge and center the traps under the bar, how to make the walk-back as economical as possible, how to properly position the feet, and so forth. In the case of machines, one must learn how to position the seat, how to enter the machine, and on completion, how to exit the machine.In other words, the actual repetitions are cake compared to the "set-up" and "break-down." The "skilled" approach is superior to the "traditional" format with regard to motor learning because it gives you twice as many set-up and break-down opportunities. In terms of strength acquisition, the "skilled" format wins again, because the athlete is less fatigued he can exert more force against the resistance on each repetition. The object of strength training is to have the most force and the least fatigue (as opposed to vice versa, which is how most people lift). Finally, because the "skilled" format leads to less fatigue, it is also safer than the traditional format. As the lifter fatigues, skilled performance declines, and the possibility of injury increases. For example, an athlete misses the uprights when he attempts to rack the bar at the end of a set because he's in a rush to escape the pain of lactic acid accumulation in his chest, deltoids, and arms. So, on all counts, low repetition (which may or may not be maximal effort reps) lifting is far preferable to the bodybuilding-type format that most people use. If I used the high rep format as a martial artist, I'd hate it too! By the way, don't get overly hung up on the number five. It could be two, three, whatever. In other words, when I point at the moon, you shouldn't be looking at my finger! FA: How important is supervision when first learning to lift weights? 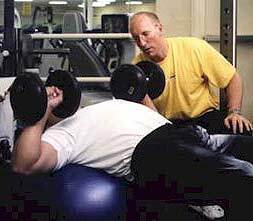 Staley: When I walk into a commercial gym, more than 99% of people are lifting improperly. You can't learn to train reading muscle magazines or from reading books, or from watching everyone else, since they're doing everything wrong as well! It's just like the martial arts, you can't learn it from a book. So it's important to find qualified supervision, at least at the beginning to form good habits. FA: What would you say as being the most common mistake you've seen? Staley: Well, they are perhaps too numerous to boil down to a few, but essentially, improper set/rep protocols (i.e., over-reliance on high repetition formats) and poor biomechanics (lifting technique) tend to top the list. Too many athletes model their weight training after bodybuilding routines, which of course, is as silly as bodybuilders performing kata. FA: As there is no substitution for quality supervision what advice could you give which would assist in training? Staley: Athletes should seek out an experienced, qualified conditioning specialist in their area. Since I have taught for and consulted to the International Sports Sciences Association for the past 10 years, let me suggest that readers call (800) 519-2492 for the name and number of a ISSA-certified specialist in their area. I have also created a specialized certification program for martial artists called Specialist in Martial Arts Conditioning for the ISSA. People can find out more by going to: http://www.issaonline.com. FA: Before we end this first section of the interview I was wondering if you wouldn't mind telling us a little about your company, Myo Dynamics? Staley: Of course. Myo Dynamics is the umbrella company under which I work with athletes, consult to various groups and organizations, teach training seminars, write for various magazines, and so on. I am based in Las Vegas, Nevada, but also travel to Los Angeles every 5 weeks to work with clients there. Incidentally, I do not require that athletes spend protracted periods of time with me. If someone has a trip planned to Las Vegas, and would like me to evaluate their training, they can call and we can set up an appointment. I also sell specialized tracking software for athletes, and my book, The Science of Martial Arts Training, was released in March, 2000. Did I leave anything out? FA: I'm sure our readers would like to know how to contact you? FA: Thank you very much Charles for a most enlightening interview! A related article by Charles Staley is Strength Development: Fundamentals for Martial Artists. Charles I. Staley, B.Sc., MSS, is a sports conditioning specialist and Vice President of Program Development for the International Sports Sciences Association. A former martial arts competitor and trainer, Staley is also an Olympic weightlifting coach, as well as a master's level track and field competitor (discus event). He has coached elite athletes from many sports, including martial arts, boxing, track & field, football, Olympic weightlifting, and bodybuilding. Staley has written over 150 published articles, and has lectured extensively on the topics of human performance and sports training. He has recently authored a text on conditioning for the martial arts, and has several other books in the planning stages. Staley's award-winning web site (Fundamentals of Strength Training for Sport, located at www.myodynamics.com) is consistently ranked among the top 50 in the world in the health & fitness category. He may be reached at (800) 519-2492, or through the internet at staley@myodynamics.com.